Voting rights and the Supreme Court: The impossible “literacy” test Louisiana used to give black voters. The Vault is Slate’s new history blog. Like us on Facebook, follow us on Twitter @slatevault, and find us on Tumblr. Find out more about what this space is all about here. Update, 7.3: Read more about my hunt for an original, archival copy of this test here. This week’s Supreme Court decision in Shelby County v. Holder overturned Section 4(b) of the 1965 Voting Rights Act, which mandated federal oversight of changes in voting procedure in jurisdictions that have a history of using a “test or device” to impede enfranchisement. Here is one example of such a test, used in Louisiana in 1964. After the end of the Civil War, would-be black voters in the South faced an array of disproportionate barriers to enfranchisement. The literacy test—supposedly applicable to both white and black prospective voters who couldn’t prove a certain level of education but in actuality disproportionately administered to black voters—was a classic example of one of these barriers. The website of the Civil Rights Movement Veterans, which collects materials related to civil rights, hosts a few samples of actual literacy tests used in Alabama, Louisiana, and Mississippi during the 1950s and 1960s. In many cases, people working within the movement collected these in order to use them in voter education, which is how we ended up with this documentary evidence. Update: This test—a word-processed transcript of an original—was linked to by Jeff Schwartz, who worked with the Congress of Racial Equality in Iberville and Tangipahoa Parishes in the summer of 1964. Schwartz wrote about his encounters with the test in this blog post. 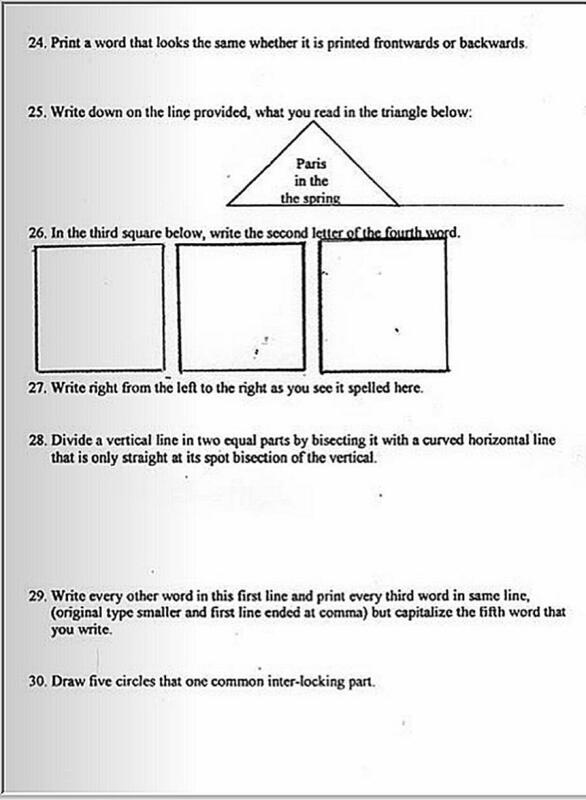 But this Louisiana “literacy” test, singular among its fellows, has nothing to do with citizenship. Designed to put the applicant through mental contortions, the test’s questions are often confusingly worded. If some of them seem unanswerable, that effect was intentional. The (white) registrar would be the ultimate judge of whether an answer was correct. 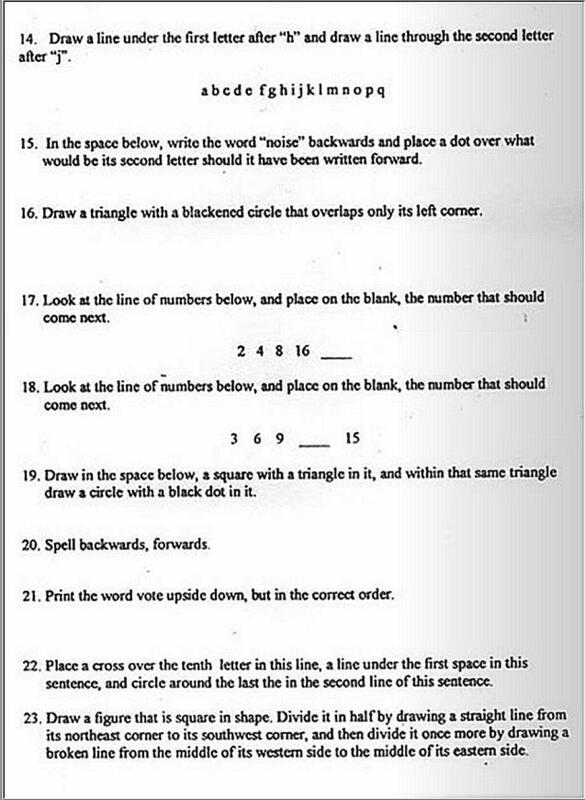 Louisiana Voter Literacy Test, circa 1964. Via the Civil Right Movement Veterans website. 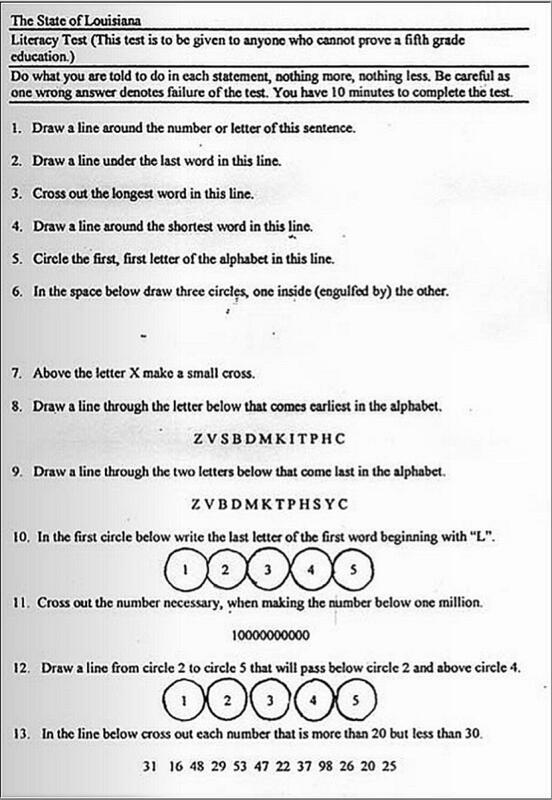 Louisiana Voter Literacy Test, circa 1964. Via the Civil Rights Movement Veterans website. There was little room for befuddlement. The test was to be taken in 10 minutes flat, and a single wrong answer meant a failing grade.